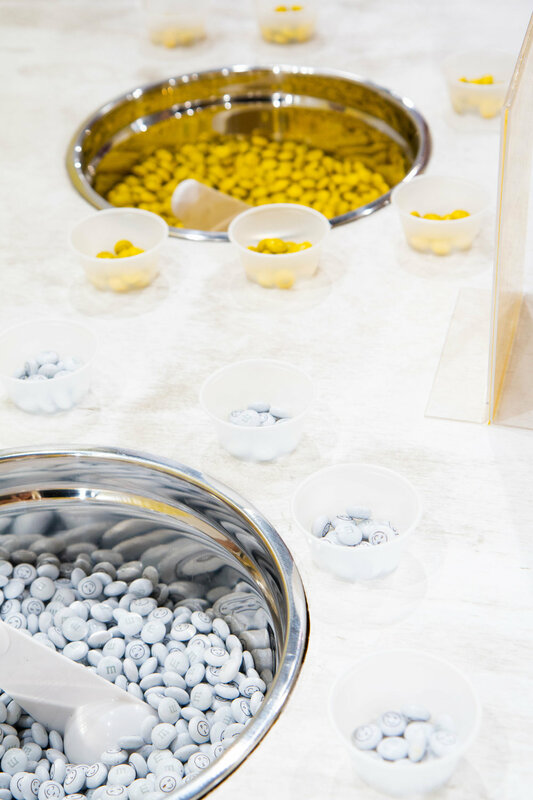 You've seen it before and you'll see it again- the pop-up trend is everywhere right now! This time, we're talking about a particularly joyful pop-up based in Chicago, called Happy Place. Last weekend I was headed to the Chi-town to visit my brother alongside my whole family, and I couldn't resist a visit to Happy Place, knowing it would be a fun outing for my Mom and sister, Moira. 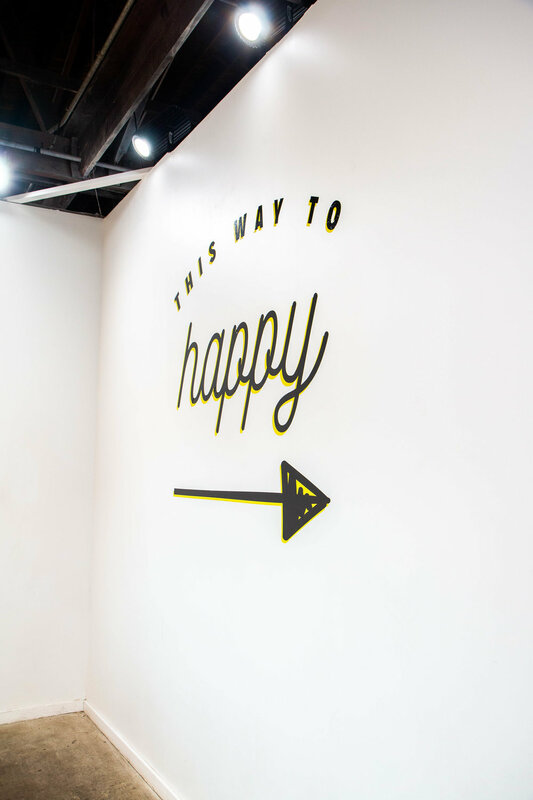 They totally knew how to start you off on the "happy train" with this entrance- a huge smiley face blow up wall, a smiling door, and fun word play on the way in, including a huge series of letters from the ceiling to the floor spelling out "don't worry be happy." 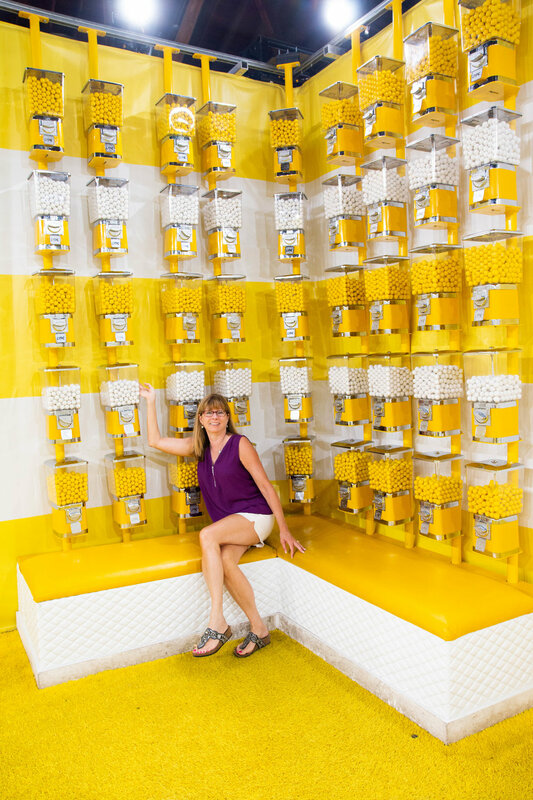 Next up was the candy room, with giant shoes made of M&Ms, a wall of candy dispensers, and your own mini cup of M&Ms. Perfect way to put a smile on anyone's face! Next was the room of LOVE. Another room that brings out an emotion that makes anyone happy, especially my little sister whose birthday is Valentine's Day! This room was too perfect for her. Next, we reached the rainbow ball pit. This room was a total show stopper and so fun to jump into the pool. One thing I will note about this pop-up was that the staff was GREAT. So accommodating as we made our way through the spaces, always offering to take photos and boomerangs whenever we wanted them. 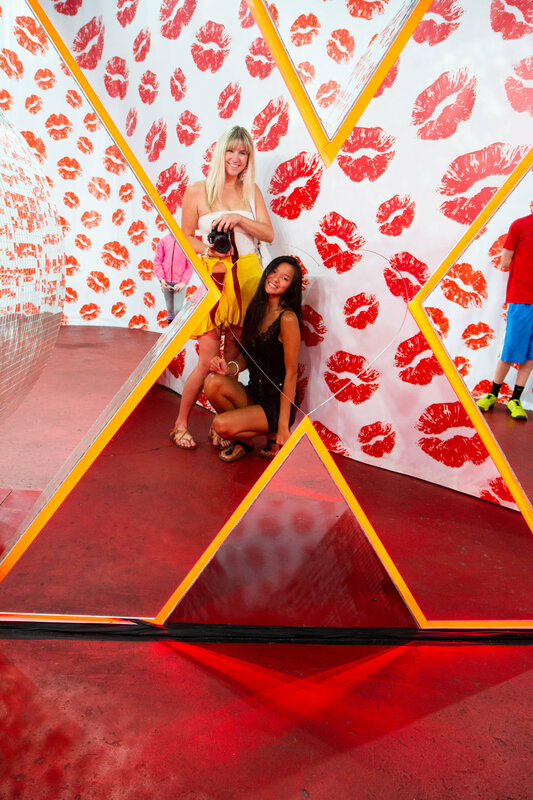 Next, we hit the mini photo booth spaces, each with its own interactive theme. A moving mirror room, a bathtub and rubber ducky room, and a room filled with swinging chains. Suddenly we found ourselves in the happy room, full of bold colorful patterns and giant LED "HAPPY" letters. Last but not least, we landed in the confetti bubble. This spot was right up LMP's alley, as the floor was made to be a large vent to blow around the confetti! Thank you, again, to Happy Place Chicago! We had a blast. Hopefully next time we see you, you'll be in NYC!